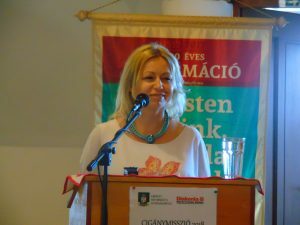 The multiplier event in Slovakia took place on the 26th of April 2018. The meeting consisted of two sessions. The morning session was intended for international participants and was organized in English. Five international participants participated in this session (representatives of a Hungarian school and regional organization). The afternoon/evening session was intended for the national participants. 22 participants (from schools, NGOs, school inspection offices and other institutions) and around 10 university employees participated in this session. During the both sessions representatives of the project consortium participated. 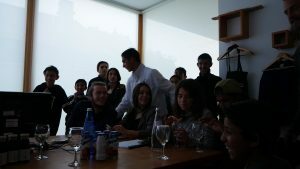 Each session consisted of an oral presentation of the project and its outputs, and of a practical workshop aimed at demonstrating the usage of all tools developed during the project. We can conclude that the meeting was successful, and participants revealed their willingness to use thematerials developed within the project. 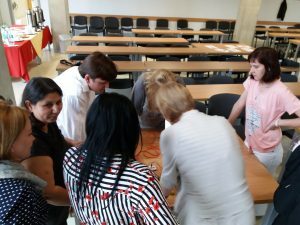 In month of may also the Romanian partner organized their multiplier event. They had invited school principals and teacher from their own and other after school teachers, media and other stakeholders. The mayor of Saint George opened the event. The children from the after school Godri Ferenc (60 in total) sang in the opening event. After that they talked about their Roma mission in area, the “Head in the Clouds” project, Erasmus+ and showed pictures of the implementation with the children of Valea Crisului. The documentary was shown, tasks and boxes were presented. Especially the digital development of the children and the town was of high interest. The guests tried to work with Ozobots and with the QR codes. 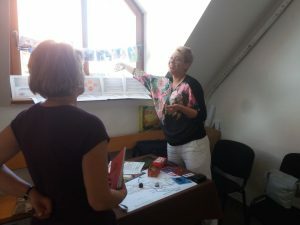 A partner of the Fundatia in Hungary was present and showed a lot of interest in the project, expressing the wish to also use all the materials in their day centres. Other international guests were priests from abroad. From the presentation and the feedback it was very clear to everyone that this project has had a high impact on the community. Not only on Valea Crisulei though but also on other after school programs run in the area. 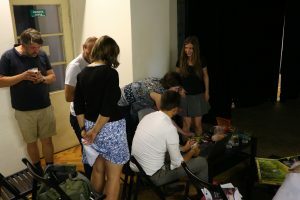 On June 19 Prague´s Creative Centre hosted a multiplier event organized by Head in the Clouds consortium presenting outcomes of the project. Numerous teachers and other experts interested in modern education took part. 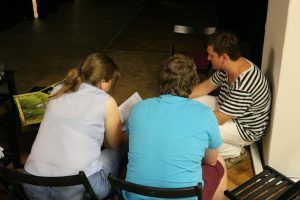 After the introductory presentation of the project, there was a discussion about methods of evaluating non-traditional forms of education, which has been gaining more and more supporters in the Czech Republic. Eventually, the participants had the opportunity to try out some of the activities of our boxes. Soon the renaissance building in Prague city centre echoed with sounds of MakeyMakey and flashes of the Ozobot sensors. We are especially pleased that some schools are planning to use some of the project outputs in regular lessons at the start of the new school year. The Multiplier Event of GAIA took place on the 29th of June in Hotel Gracanica. The place was chosen because of shared values and certain practices concerning Roma population. 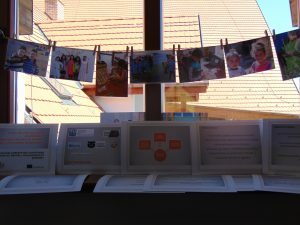 The program of the event was envisioned as informative, educational, experimental and entertaining, starting with an exhibition of photographs of our implementation period, followed by oral presentation of the program, partners and goal group, and a screening of a movie made by participant of the program as well as the documentary reportage created by the project team. 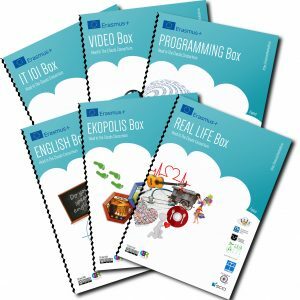 After the initial part, participant of the program had the opportunity to present four boxes – programs they have enjoyed the most. Spread around the hotel lounge and meeting rooms, stations with activities and equipment were set up by children and visitors of the ME. 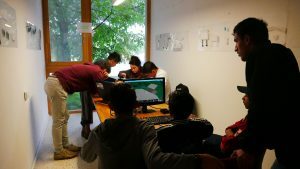 The next two hours were dedicated to Minecraft exploration, Ecopolis game and the possibility to learn English with it, Lego WeDo programming and crafts from the Real Life Box with useful hacks and skill sharing activities. Adults and children mixed, teaching each other, learning together. During presentation and buffet, visitors and members of the project implementation team shared their experiences and opinions about the project theme and actual implementation, where many have been introduced to SOLE or the HiC idea for the first time. After the practical part has ended, all participants and guests had dinner with casual discussion of possible cooperation, mutual visits and presentation of the program in other centers similar to Imaginatorium. The event was supported by the Swiss Embassy in Pristina, Cultural Centre of Gracanica, Volunteer center of Vojvodina, Roma Versitas and educators involved in communities around Kosovo.